Letâ€™s run through an example usage of JSLint. We are writing a simple jQuery plugin that displays a message specified in the msg parameter with a prefix. The prefix is hidden if we pass the value false through the type parameter. Although this piece of code works fine as a plugin for jQuery, when you use it in Firefox or Chrome, you can see that there are some glaring mistakes and some very subtle ones. Instead of spending your mental energy digging out the problems, let’s use JSLint to help us. 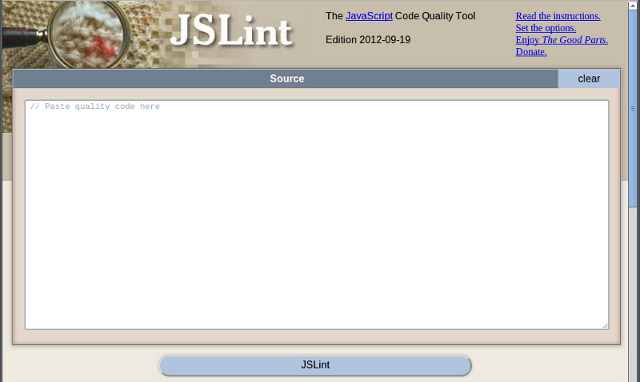 Copy the function code into the text area on the JSLint site and click the “JSLint” button. Some of the resulting JSLint output is shown in the figure below. The first error pointed out by JSLint is that the "use strict" statement is missing. This error indicates that the function is not executed in strict mode.Â To correct this error, enable strict mode by adding the following string literal to the beginning of the function body. After enabling strict mode, click the “JSLint” button again. The reported error of the missing "use strict" should be gone. We can now move on to the next error, shown in the following figure.Â This error deals with whitespace, and is more cosmetic than functional. Since this is not an actual error, you can safely ignore it. You can choose to stick with no space after the function keyword, and suppress the error message byÂ scrolling to the bottom of the page and switching the “messy white space” option to true. For now, however, we want to keep the default behavior because this option also checks for other whitespace issues as we will see later. Also notice that the second and third errors reported by JSLint are also on the same line but at different positions.Â Looks like a space between the closing parenthesis and the opening brace is also recommended by JSLint, so fix that now. By clicking the “JSLint” button again, we see that the next problem is on line 8, at position 39. The prefixes object literal contains two identical warning properties, which is obviously a mistake.Â Let’s correct the problem by replacing the second occurrence of warning with caution. Without clicking the “JSLint”Â button again, let’s look at the next error, shown in the following figure. The object literal contains a trailing comma. Browsers such as Chrome and Firefox may be tolerant of such mistakes but Internet Explorer does not take too kindly to such transgressions. To correct the problem, simply remove the comma. While fixing this problem, we can also refactor our code.Â Since the default value of concatMsg is msg, we can assign this value immediately and change it later if need be.Â The code for concatMsg can now be rewritten as shown below. Next, we encounter the same whitespace issue as earlier, which can be corrected in the same way. Next, JSLint reports that a semicolon is missing. This message is shown below. Without the semicolon, JSLint assumes that the statement is never terminated. That is why it saw if while expecting a semicolon. While the language specification says that the ending semicolon is optional, it is good practice to include it. This is another area where sloppy coding can lead to hard-to-find bugs in large scale productions. By linting our code, we can fix such problems quickly and easily. The next error is another cosmetic suggestion by JSLint. The fact that there is one more space than the expected number is pretty trivial at first glance. However, indentation problems can lead to bugs that are hard to catch in large scripts. For consistency, move the closing brace back into place by removing the extra space. Finally, two problems are reported at the last line, as shown below. The first problem is a suggestion to place the closingÂ parentheses after the closing one behind jQuery because it leaves no ambiguity that you want the function definition to be a closure.Â The second problem is that in JSLintâ€™s view, the variable jQuery is not present, although it might have been included in the web page by linking to a jQuery file. To address this issue, type jQuery into the bottom text field. If you run JSLint again, it will detectÂ that the function accepts three parameters. However, in this example, the third parameter is never used.Â There are two approaches you can take here. The first one is to remove the parameter since it is never used.Â The second option is to toggle the JSLint property â€œunused parametersâ€� to true, as shown below.Â Choose this option only if you really want to keep the parameter in the function signature for some reason. After using JSLint to improve our code, the final product is shown below. JSLint directives allow you to define variables and provide other options to JSLint from directly within the source code. This frees you from having to set the JSLint GUI options repeatedly. For example, the comments in the following example define a global variable named jQuery and set the “unparam” option to true. In this short example, JSLint has pointed out some critical errors and some seemingly insignificant ones. The fact that JSLint helps us catch these issues before we actually run the code is hugely beneficial in terms of developer productivity and application quality. If you are serious about writing production quality code, always run it through JSLint before pushing it to the server. JSLint is even contained in a single JS file, so you can download it use it offline too!